Flying into Lisbon and out of Faro with accommodation in historic pousadas allows for a day exploring Lisbon from Palmela, then across to the east into the Alentejo to stay in the legendary carpet making town of Arraiolos followed by a night in the historic town of Villa Vicosa from which the Royal cities of Evora and Estremoz can be visited. Beja, further south, will introduce you to the fabulous plains and cork forests of the Alentejo, then end your trip with two nights in the Eastern Algarve. On arrival at Lisbon airport, collect your hire car and drive south to Palmela (45km / 30 minutes). Apart from exploring the town, this location affords the opportunity to visit one of Portugal's most famous wine producing regions and to drive along the relatively unknown Atlantic coastline. Alternatively, as you are not far from Lisbon you can spend a day in this very much underrated European capital. Perched above the town, this historical 28 room pousada, a converted fortress, occupies a commanding and virtually unassailable position 250 metres above sea level. The castle was captured from the Moors in the middle of the 12th century but nobody knows exactly when it was built - probably before Christ. The location has been the setting of many historic battles. The views from the pousada are panoramic. As in most pousadas there is a very good restaurant. Drive north, but still in the Alentejo, from Arraiolos to Vila Viçosa (70km / 50 minutes) for an overnight stay in the historic Pousada Convento de Vila Viçosa. This converted 500 year old convent with 39 rooms was one of the most opulent in Portugal and very central to the village. It was here that Catherine of Bragança, Princess of Portugal and Queen Consort of England by marriage to Charles II of England was born. The building is magnificent and very interesting to explore and you can’t help feeling that you are participating in Portuguese history itself. Time to explore the town and also to visit the Ducal Palace of the Braganças, the most powerful family in Portugal after the royal family. The city of Beja, at 277 metres above sea level commands a strategic position over the vast plains of the lower Alentejo. Already inhabited in Celtic times, Beja with a current population of 40,000, has been the scene of attack and counterattack as armies, both Christian and Arab waged war to and fro across the region. It is a very interesting city to explore. Overnight stay at the historic, 35 room pousada in Beja, once the former Monastery of St Francis which is an impressive building and a spiritual and relaxing oasis in the centre of Beja. Spend time wandering the narrow streets. Overnight at the Pousada Convento de Beja. It is 146km (1½ hours) drive south into the Algarve from Beja to Estoi where you will stay for two nights. Estoi is a parish in the municipality of Faro with a population of 5,000. 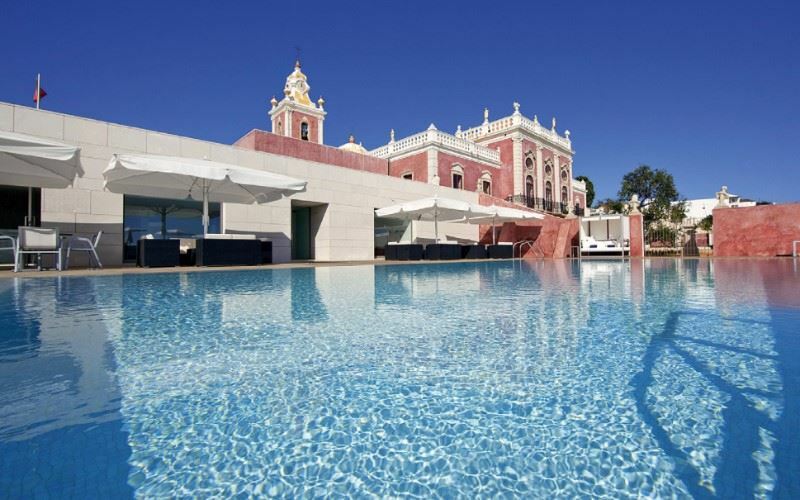 The ornate palace of Estoi, renowned for its gardens and azulejos tiles is now the 5 star, 63 room historical Pousada Palácio de Estoi, where rococo glamour meets 21st century design. This is an ideal base from which to tour the eastern Algarve, to explore the nearby Milreu Roman ruins or mingle with the crowds in Faro’s bustling squares. As an alternative, you can end your stay in the western Algarve in Sagres, 196km (2 hours drive) from Beja, by staying in the cliff-top, 51 room Pousada de Sagres. The area around the hotel is wild and windswept with many beautiful Atlantic beaches. The pousada has an excellent restaurant, particularly known for its seafood cuisine. It is within walking distance of the fishing town of Sagres and from the pousada there are impressive views over the fortress of Sagres and the Atlantic beyond. After breakfast, drive to Faro airport (12km / 15 minutes) for your return flight to the UK. The Pousada Palmela is set within an imposing hilltop fortress, originally constructed in the late 14th century. The Pousada Palmela is set within an imposing hilltop fortress, originally constructed in the late 14th century. Over the centuries the fortress has served as a castle and a monastery, and proof of this fascinating history is visible throughout the property. The dining room, in the former monks refectory, still houses the lectern; the ancient cloisters, furnished with antiques, now form comfortable areas in which to relax; the former monastic cells have been furnished to provide twenty-eight attractive bedrooms and the original 14th century keep affords a beautiful view westwards towards Setubal and the Arrabida Nature Park, northwards to Palmela and eastwards over the Alentejo plains. On a clear day, Lisbon and the Serra de Sintra can be seen. The 15th century church of Santiago stands next to the Pousada. Its interior contains the sepulchre of Jorge of Lencastre and a wall decorated with 17th and 18th century tiles. This Pousada, converted from a 16th century monastery, is set in the green valley of Arraiolos, a city known for the traditional art of carpet making. This Pousada, converted from a 16th century monastery, is set in the green valley of Arraiolos, a city known for the traditional art of carpet making. The woven carpets of Arraiolos, originally based on the Persian designs but more colourful in style can be purchased locally. There are also some excellent examples of Azulejos tiles displayed in the 16th century Misericordia building of this quaint, white-washed medieval city. The famous Palácio de Estoí was originally built in the 19th century as the ancestral home of the Viscount of Estoí, José Francisco da Silva. The famous Palácio de Estoí was originally built in the 19th century as the ancestral home of the Viscount of Estoí, José Francisco da Silva. The romantic taste of the first owner, a descendant of one of the most distinguished families of the Algarve, inspired him to build a neo-baroque and neo-rococo styled country house surrounded by beautiful gardens. Today, this former home has been converted in to a luxury Pousada providing high quality guest accommodation just a short drive from Faro. Outdoor swimming pool (14 x 7m), children's pool and pool bar (open from 11:00 to 19:00 during the summer only). Pool towels are provided. 13km from the coast with its’ long sandy beaches, golf courses and the Ria Formosa Nature Park.